Ischemic stroke | Healios K.K. The term “stroke” refers to an event in which a blood vessel in the brain bursts or becomes blocked, depriving cells of nutrients in the areas downstream of the damage and impairing the function of the brain. Strokes are broadly divided into two types based on their cause: cerebral infarctions, in which a blood vessel in the brain becomes blocked, and cerebral hemorrhage or subarachnoid hemorrhage, in which the blood vessel ruptures. In Japan and throughout most of Asia, 70 to 75% of strokes are believed to be caused by cerebral infarctions. Symptoms vary depending on the location of the blocked blood vessel, but in most cases, once a stroke has occurred, survivors suffer from after-effects such as numbness or speech impediments. Stroke is the fourth leading cause of death among Japanese people, and represents a leading cause of serious disability. For those that survive, many will require care from a loved one or a nurse for the remainder of their lives. Stroke is the direct cause of 18.4% of all the patients requiring nursing care. 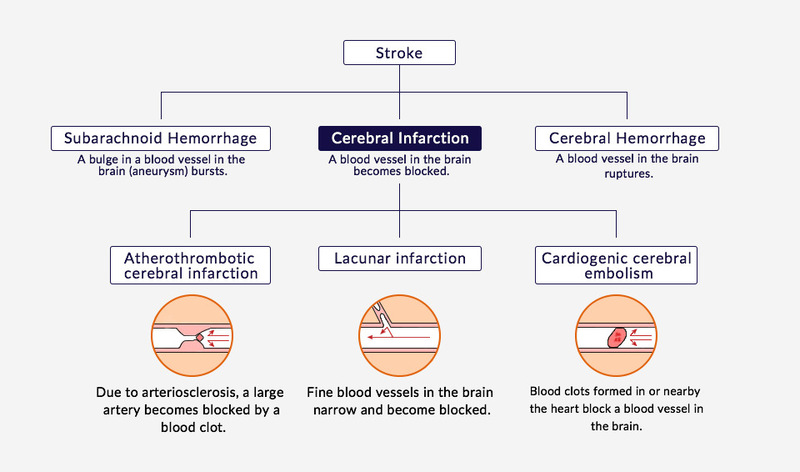 Treatments commonly used for the acute phase of a cerebral infarction are thrombolytic treatment (t-PA treatment), which dissolves blood clots that have blocked vessels in the brain, or mechanical thrombectomy, in which blood flow is restored through the direct removal of the clot from the blocked blood vessel. 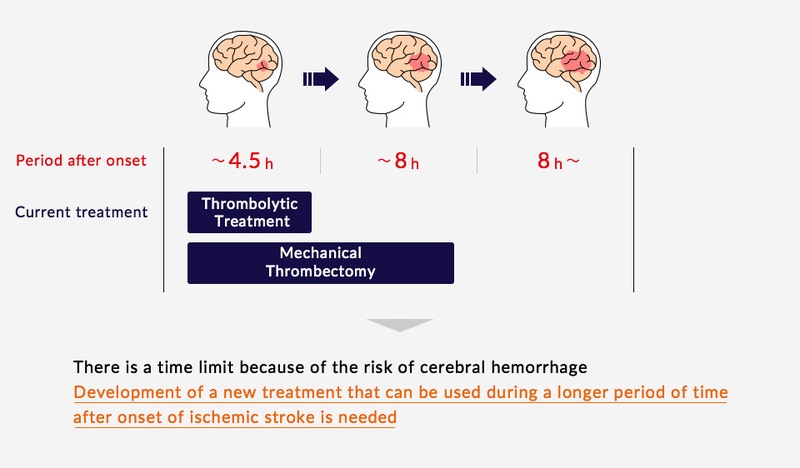 Thrombolytic treatment may only be administered within 4.5 hours of the onset of the stroke, and mechanical thrombectomy can only be performed within 8 hours. Many stroke patients do not arrive at the hospital or receive treatment within these windows, or may experience treatment related complications, such as intracerebral bleeding. Thus, development of a new treatment that can be used during a longer period of time after onset of ischemic stroke is needed. *Treatments are applied depending on the patient’s condition and types of symptoms. Treatments other than thrombolytic treatment and mechanical thrombectomy may also be applied. Healios has acquired the right to develop and commercialize the stem cell product MultiStem® (HLCM051), created by Athersys, for domestic use in the treatment of ischemic stroke. We are conducting a clinical trial using this novel cellular treatment method for the treatment of acute cerebral infarctions in Japan. HLCM051 is administered to patients by intravenous infusion and does not require immunosuppressant drugs. Data has shown that MultiStem is eliminated by the body over time following administration without accumulating. 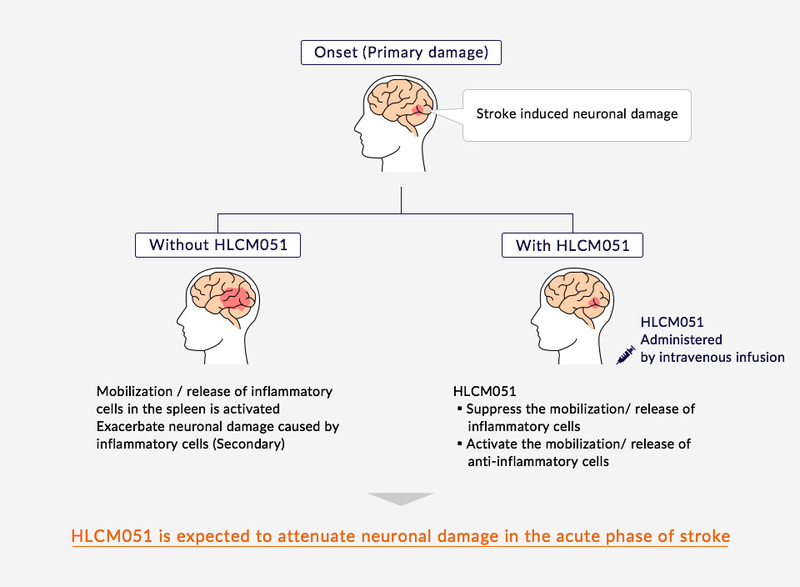 Athersys has conducted clinical trials in the US and UK on HLCM051’s effects during the acute phase of cerebral infarctions and has indicated that it expects HLCM051 to be safe for patients and to provide a therapeutic benefit if given within 36 hours of the stroke. This is a time frame that is relevant to many stroke patients. By inhibiting the activation of inflammatory immune cells in the spleen, where many immune cells reside, and thereby reducing inflammation and immunoreaction, HLCM051 reduces damage to nerve cells. Furthermore, MultiStem is expected to increase anti-inflammatory cell numbers and protect nerves through the release of nutrient factors. Currently, Healios is conducting a Phase II/III clinical trial in Japan targeting patients in the acute phase of cerebral infarction (trial name: TREASURE). Patients within 36 hours of the onset of a cerebral infarction are administered one dose of either HLCM051 or a placebo intravenously.The details of the TREASURE trial are registered at ClinicalTrials.gov. (Identifier: NCT02961504). Additionally, HLCM051 was designated by the Ministry of Health, Labour and Welfare as a target for the Sakigake Designation System in February of 2017 as a regenerative medicine product. For details of the Sakigake Designation System, please refer the website of the Ministry of Health, Labour and Welfare. © HEALIOS K.K. All rights reserved.